Television is certainly an upside-down world. Reality TV is anything but real, and scripted shows often provide the most true glimpses of the world we live in. One subplot concerned the quietly organized sick-out by musicians employed by the fictional “Studio 60” show as well as the real “Tonight Show” – bandleader Kevin Eubanks makes a cameo appearance. Executive Producer Danny Tripp (played by Bradley Whitford) deduces that the job action is being done to provide substitute work for homeless New Orleans musicians, “any of which could play our band under the table,” says Danny, to provide them with money and a path to the L.A. Musician’s union. Danny decides to gather up as many of these refugees as he can and give them a spotlight performance on the show. 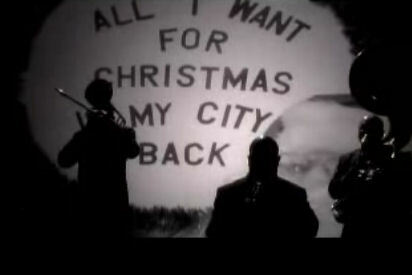 The band, led by the amazing Troy “Trombone Shorty”Andrews, plays a jazz version of “O Holy Night” with a stark black and white photo montage of the New Orleans reconstruction effort as a backdrop. Their performance literally had me choking back tears. New Orleans jazz is a kind of judo – it seems so simple and unadorned, yet so few musicians can play it with authority. One sustained note (where a vocalist would sing “O Night, O Night Divine”) from Andrews’ trumpet communicated such an powerful range of emotions. Sorrow, hope, despair, rage, resolution – all unmistakably articulated. Tiptina seems like a worthy group, and I’m pleased to see NBC blurring the lines between the ostensibly real and make-believe worlds. For those of us who learned about prejudice on “All In the Family,” it makes complete sense. You can see and hear “O Holy Night” on YouTube, and a free audio version is supposed to be up on iTunes soon. UPDATE: NBC lawyered away the YouTube version, so you have to go to their website, click on the “watch the musical highlight” link, and wait through a tepid “Nacho Libre” advert in order to see it. That’s all fine, but NBC’s version is chopped at the end, not faded. Quite inferior. One further note: the “Christmas Story” episode re-airs December 18. 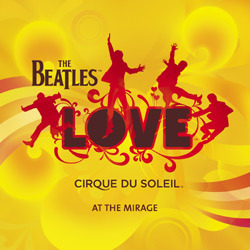 Like many Beatles fans, I reacted cynically to news of the recently released “Love.” Why should I care what Cirque du Soleil, which commissioned the work for a show at the Las Vegas Mirage Hotel, did with my favorite Beatles songs? I also couldn’t see the point of once again repackaging familiar music. Why not put out the band’s full length 1966 Budokan performance on DVD, or release some of the long-rumored Beatles music that never made it to disc? Heck, a CD version of “Live at the Hollywood Bowl” would be nice. Then I heard “Love” and everything changed. The record (also available in DVD-Audio) is an archaeologist’s excavation done by a punk with P. Diddy’s ethics; it’s as if he dug up the crown jewels and decided to pierce his tongue with the best diamond in the pile. George Martin and his son Giles share production credits, but there’s little doubt in my mind that this is the youngster’s work. Giles was born the year the Beatles broke up, and by all accounts didn’t listen to the band much in his youth. It shows – only an un-churched soul would have the temerity to combine the crashing guitar start of “Hard Day’s Night” together with Ringo’s only drum solo (“The End”) as an intro to “Get Back,” one of the few Fab Four tracks that Sir George didn’t produce. It’s like Danger Mouse’s notorious “Grey Album” sans Jay-Z. “Love” isn’t all clever stunts, though. Sir George starkly scores the earliest version of “While My Guitar Gently Weeps,” and the father-son duo lovingly trace “Strawberry Fields Forever” from rough demo origins, through early takes to finished master. Tracks presented mostly intact – “Lady Madonna,” “Back in the U.S.S.R.” and “I Want To Hold Your Hand” – are noticeably cleaned up to reveal the band’s stellar musicianship, in particular Paul McCartney’s bass playing. “Love” is both a puzzle for longtime fans to solve, and a perfect way to expose the Beatles to a new generation. So what’s on tap this weekend? Thursday: Jason Cann, Brown’s Tavern – A talented guitarist who’s holding down a regular First Saturday gig at Bistro Nouveau, as well as two nights weekly at this Ascutney nightspot. Things are jumping on the mountain, even if the natural snow hasn’t arrived. Cann’s songbook ranges from the Grateful Dead to Dan Loggins, and goes down as easy as a cold Long Trail. Friday: ÓhAnleigh, Salt Hill Pub – This northern Vermont trio plays traditional Irish music with youthful verve. “Ain’t It Bloody Well Grand to Be Irish (And Living in the USA)” is one of my favorites, name-checking Boston and celebrating the Americanized Irish. They’re already booked for March 17, 2007, but you can order a pint and enjoy them tonight. Anytime’s good to celebrate St. Patrick’s Day at the Pub. Saturday: The Alchemystics, Seven Barrel Brewery – From Northampton, a band described as “a marriage between dub reggae and hip-hop” lands in West Lebanon. They have a nice, clean rhythmic sound, and based on their MySpace tracks don’t seem like bling and violence-obsessed rappers. Frontman Phaze is leaving the band next month, so this is a final chance to see the original lineup. Sunday: Gandalf Murphy & The Slambovian Circus of Dreams, Middle Earth – Two shows (4 and 8 PM) by the gypsy rockers, with stellar support from Sloan Wainwright (Loudon’s younger sister) and the neo-folk Kennedys. Sarah and Pete Kennedy deserve a set of their own, and Sloan’s no slouch. You already know how great Gandalf’s gang is, so I’d suggest that this is one of the better entertainment bargains you’re going to see this year. Tuesday: Winterpills, Iron Horse – Northampton’s Beatles perform a benefit for Safe Passage, who help provide programs for child victims of domestic violence. Winterpills recently laid down several new tracks for an upcoming (February ’07) album. They’ve also put together a fun little YouTube video blog. Also on the bill are the Fawns, and June Millington (of Fanny and the Slammin’ Babes). Wednesday: Ted Mortimer and Linda Boudreault, Canoe Club – The husband and wife team has a pretty full calendar this month. In addition to playing Hanover’s finest downtown restaurant, they’re also appearing at Sophie & Zeke’s in Claremont Friday (December 8), where their band (Dr. Burma) headlines an end of the year party December 29. Ted has a just-so touch on the Gibson Jazz Guitar, and Linda sings like a dream.